USB3.0 mid reverse connectors are designed for inclusion in such devices as tablets, notepads, and other handheld devices. Mid bottom mount USB3.0 connectors are available for low-profile applications where height above and below PCB is critical. Allow mounting on bottom of PCB, reverse connectors sit in cut out on PCB to minimize height. With cutaway face, USB1115Â has .212 in.Â body height and suits angled panels. While USB1110 is mounted below PCB,Â bulk sits above PCB. 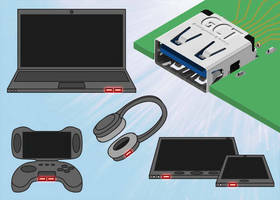 In low profile applications where height above and below the PCB is key, GCT offers mid bottom mount USB3.0 connectors. USB3.0 full size connectors are mounted as standard on the topside of the PCB. GCT’s innovative reverse connectors allow mounting on the bottom of the PCB, the connectors sits in a cut out on the printed circuit board thus minimizing height. Receptacle insulators have perfect orientation to allow normal cable assembly plug mating with USB symbol facing upwards. USB1115 with cutaway face is perfect for angled panels, with an ultra slim .212” body height. To speed up design downloadable drawings, 3D models and specifications are available from the GCT website. Parts are in stock in your local GCT office for next day sampling. Call today to discuss design requirements, or visit www.gct.co to see why GCT should be the supplier of choice for USB connectors.